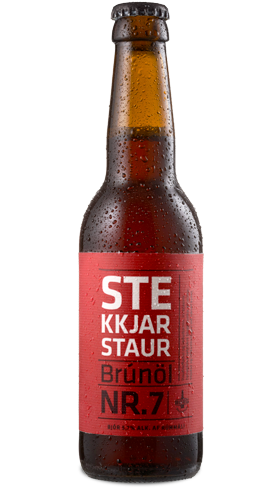 Stekkjarstaur, or Sheep-Cote Clod, is the first Christmas beer from Borg, reddish brown ale brewed with rock candy, oats and three types of malt; pale ale, caramel and chocolate. Full-bodied. Spicy and fruity aroma. Stekkjarstaur is named after one of the 13 Icelandic Yule Lads who bear little resemblance to Santa Claus. The Yule Lads are the sons of Grýla and Leppalúði, two of the most hideous ogres known to man, and their original role was to strike fear in the hearts of children.